Discover northwestern Chiapas’ top cultural and natural attractions on this day trip from either Tuxtla Gutiérrez or San Cristóbal de las Casas. 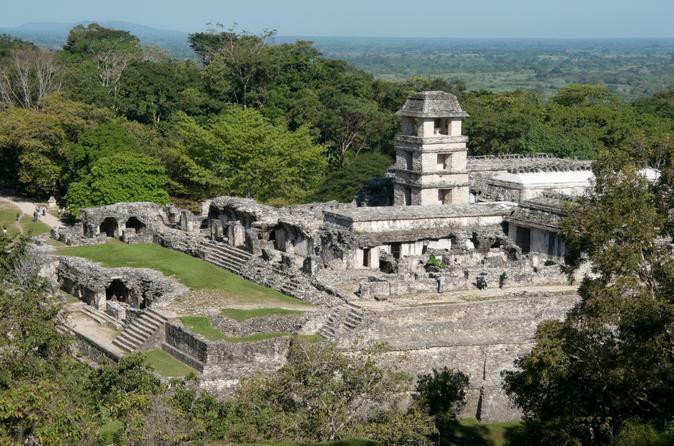 First, visit Palenque, a World Heritage-listed archeological site and one of the best-preserved Mayan cities in the state. Then head to Misol-Ha waterfall for a refreshing swim, and continue to the stunning Agua Azul, a series of waterfalls that pour into a river of bright turquoise water. These rainforest destinations are some of the most beautiful in Chiapas! Have you ever wanted to fly through the sky above a forest? 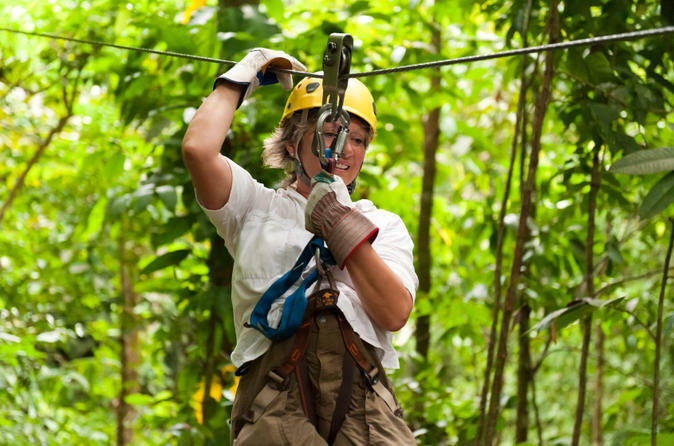 This zipline tour through the rainforest from San Cristóbal or Tuxtla Gutiérrez is your chance. Ride three amazing ziplines that are up to 656 feet (200 meters) long and 164 feet (50 meters) off the ground. Get an incredible view of the surroundings as you fly through canyons and over rivers. Includes hotel pickup and drop-off. Learn about the indigenous cultures of the Chiapas Highlands while experiencing a thrilling bike ride through the mountains. 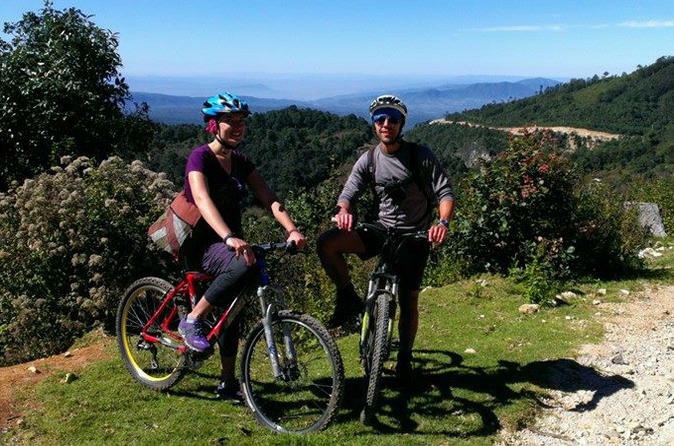 Departing from Tuxtla Gutiérrez or San Cristóbal de las Casas, ride through beautiful mountains and nature across single-track terrain. Experience the traditions and lifestyle of the people who belong to the Tzotzil tribe. This active cultural tour will show you one of the most fascinating regions in Mexico. Includes hotel pickup and drop-off. 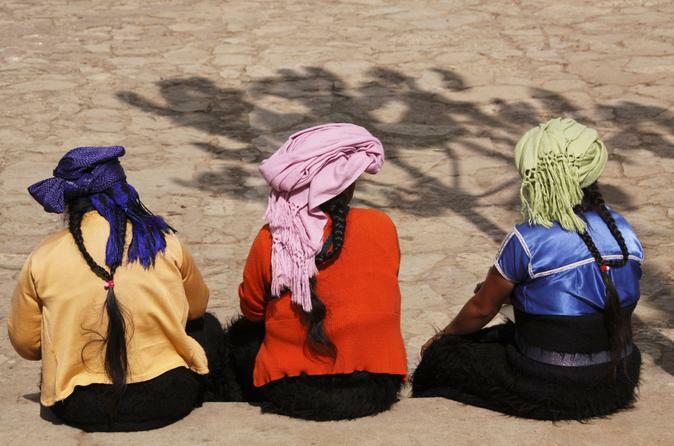 Learn about the traditional customs of Mexico’s native Tzotzil people, a Mayan group, on this tour to two indigenous villages in the Chiapas Highlands. With an experienced guide, visit the village church in San Juan Chamula to observe healing rituals and prayers. Then see how the Tzotzil women in San Lorenzo Zinacantán weave elaborate fabrics, and enjoy a sample of warm homemade tortillas. Hotel transport is available from Tuxtla Gutiérrez and San Cristóbal de las Casas. Enjoy personalized attention on this small-group tour, limited to 13 people. Get ready for an experience filled with adventure and excitement as you enjoy the impressive Sumidero Canyon, making stops in the viewpoints of this natural wonder. Then, enjoy a gastronomical experience eating a traditional buffet and admiring the fountain at Chiapa de Corzo Magical Town. Discover two of southeastern Chiapas’ natural wonders on this tour to El Chiflón waterfall and Montebello Lakes National Park. At El Chiflón, you can get a fun workout with the 800-step climb to the top of the waterfall, or just relax with a refreshing dip in the natural pool at the bottom. Then be wowed by Montebello Lakes, a UNESCO Biosphere Reserve home to 50+ lakes known for their various blue, green and purple hues and surrounded by forest-clad hills. Round-trip transport is available from either Tuxtla Gutiérrez or San Cristóbal de las Casas. Visit the fascinating Toniná ruins and tour the city of Ocosingo on this day trip from Tuxtla Gutiérrez or San Cristóbal de las Casas. 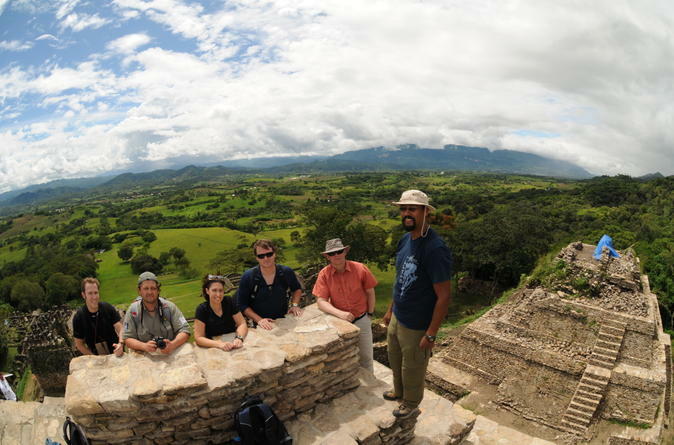 Explore ancient Mayan ruins for a rare glimpse into the pre-Columbian era, and climb to the summit of the archaeological site for spectacular valley views. Then head to Ocosingo for a look at authentic Mexican city life transformed over time. Sights include the Church San Jacinto de Polonia and the traditional Tianguis Campesino food market. End with a visit to the El Corralito waterfalls amidst the countryside. 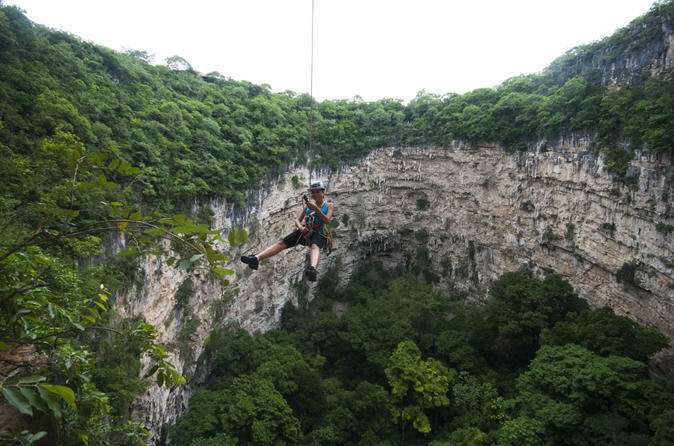 This rappel adventure is a thrilling way to explore the natural beauty and cultural history of Mexico. Your expert guide will instruct you how to rappel safely and usher you into the famous sinkhole La Sima de las Cotorras (Sinkhole of Parrots), where you’ll see ancient art and get a different perspective on our planet. 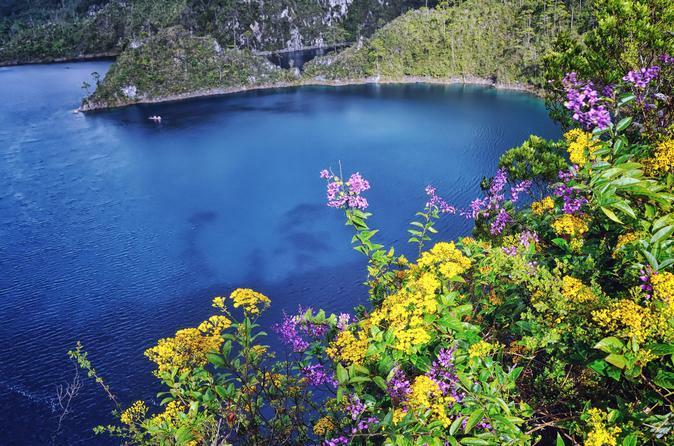 In addition, you’ll see part of Mexico’s Selva El Ocote Biosphere Reserve. 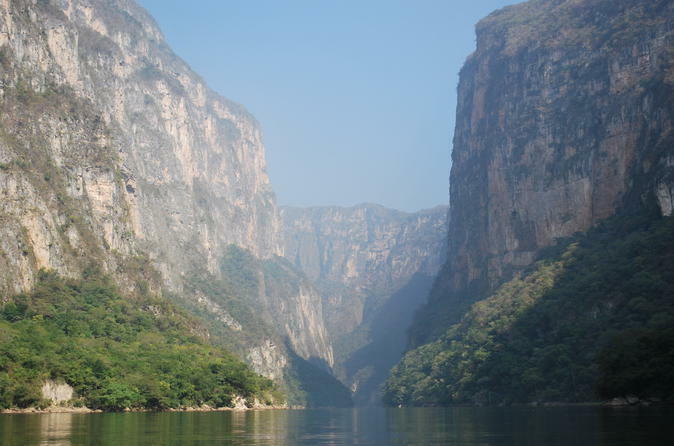 Visit one of Chiapas’ most popular natural sites on this tour to Sumidero Canyon National Park. Your experience begins in the historical town of Chiapa de Corzo, where you’ll see colonial attractions like Santo Domingo Church with a local guide. 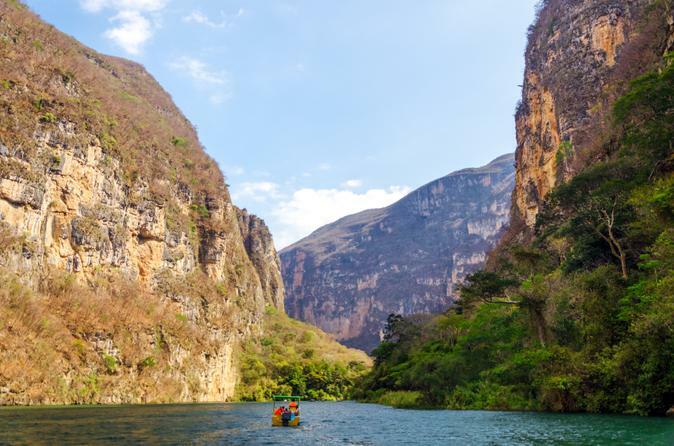 Then experience Sumidero Canyon on a scenic boat ride along the Grijalva River, which runs all the way through the canyon and provides you with incredible views of its dramatic cliffs and native wildlife. Transport is available from Tuxtla Gutiérrez or San Cristóbal de las Casas.